Stakeholders are seeking to amplify the role of Indonesia’s services sector to manage the country’s current account and balance of payment in the face of dwindling commodity prices and a stagnant manufacturing industry. Between 2010 and 2017, Indonesia’s services sector grew at an average of 7.1 percent per year, much higher than the manufacturing and agricultural sectors at 4.4 percent and 3.7 percent, respectively, according to Statistics Indonesia (BPS). “The more advanced a country becomes, the larger a role its services sector plays, especially as Indonesia is keen to implement the fourth industrial revolution, or Industry 4.0,” the Trade Ministry’s director general for international trade negotiations, Iman Pambagyo, said at a recent seminar in Jakarta held by the Centre for Strategic and International Studies (CSIS). Unfortunately, Iman said, the data available on Indonesia’s services sector is scarce, and Bank Indonesia (BI) and the BPS — who are in charge of collecting them — do not offer a comparable database to the international standards used in trade negotiations. This has limited the sector’s potentials, which according to the BPS, had contributed a whopping 43.6 percent to the national GDP in 2017. 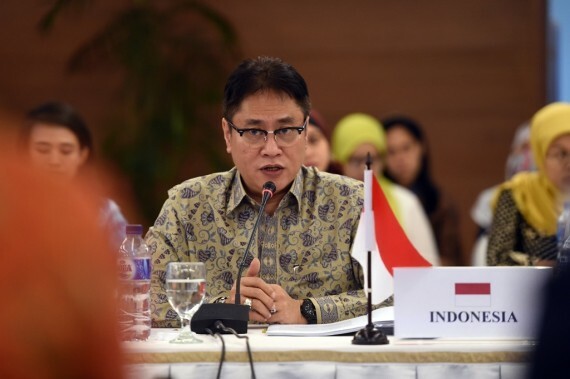 The lack of data, Iman added, also downsized Indonesia’s position in the trade talks it was involved in as they were heavy on services-related discussions, such as the Regional Comprehensive Economic Partnership, the Indonesia-European Union Comprehensive Economic Partnership Agreement and the Indonesia-Australia CEPA. CSIS senior fellow and former trade minister Mari Elka Pangestu cited a study by the Organization for Economic and Cooperation Development (OECD), which found that Indonesia is one of the most restrictive countries for service traders. In the OECD’s 2017 Services Trade Restrictiveness Index, Indonesia was found to be the most restrictive in legal, distribution, insurance, telecommunications and maritime transport services, compared to 43 other countries the study observed. “The absorption of service workers is moving more toward informal sectors [and] menial jobs in trade and construction, while there are fewer workers in the more modern, high-skilled services sectors,” Mari said on the same occasion. The lagging development of services, she said, also played a part in Indonesia’s lack of participation in the global value chain, which requires human resources to bring more added value to physical goods. Devi Ariyani, executive director of the Indonesia Services Dialogue (ISD) council, said service traders had been looking forward to the revision of Finance Ministerial Regulation No. 70/PMK.03/2010 on taxable exported services, which will encourage more exports of services. The regulation relieves three sectors — construction, maintenance and makloon (a third party providing customized services, usually on clothing and garments) — from a 10 percent value-added export tax. In October 2018, the ministry’s director general of taxation, Robert Pakpahan, said a revision that would relieve at least three more sectors was underway. “Further, the government should also pay attention to market access and capital inflow for Indonesia’s services sector, so that its providers would be able to earn proper revenue,” Devi said in the event.